UPDATE: The snowball fight originally scheduled for Tuesday has been rescheduled to Wednesday at noon due to UBC’s decision to cancel most classes throughout the day. 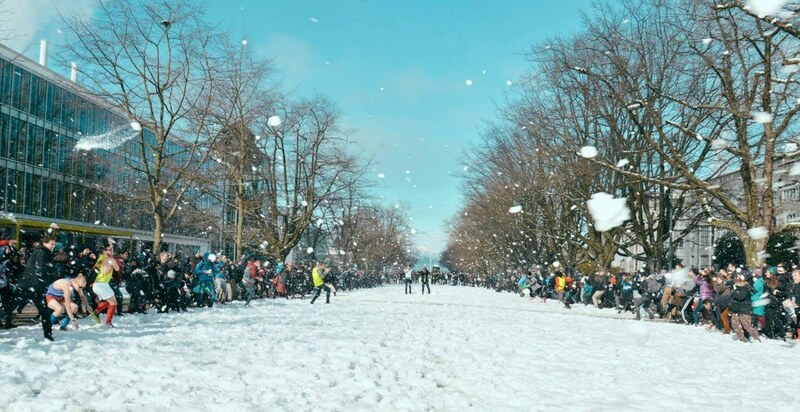 There’s no better way to celebrate the snow than with a giant snowball fight and that is exactly what’s going down at UBC’s Vancouver campus Wednesday. The UBC Party Calendar is hosting the event and over 3,000 people have already said they are attending on the event’s Facebook page since it went live last night. “Whenever it snows in Vancouver we always try to organize the snowball fight. The last time we organized the event in 2017, thousands of students and staff showed up and news outlets from around the world covered the fight,” said UBC Party Calendar’s Andria Coulbourn, in a release. The 2017 event was an epic success with well over 3,000 people in attendance. If you want to join in on the fun, people are invited to line up at 11:45 am on Main Mall near Martha Piper Plaza and stretching down the open area as needed. The fight will officially commence at noon. Bring your mittens and get ready for the most epic snowball fight of the year!